Over the past five years, the Serpentine Gallery Pavilions have given us the opportunity to realise a series of architecturally experimental designs, drawing on our materials skills, in-house facilities and love of innovation in new and exciting ways. This on-going programme of temporary structures presents work by a different leading international architect or design team each year. 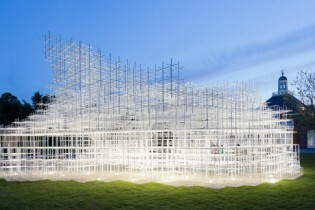 The result is a back-catalogue of pavilions that embody innovation, experimentation and diversity that is unique worldwide and which has become one of the most anticipated events in the global design calendar. The immediacy of the process – a maximum of six months from invitation to completion – plays to our strengths in creative manufacturing and delivering to tight deadlines. From a manufacturing and construction perspective, each pavilion has presented us with a polar opposite of the previous year, resulting in a working palette of materials that include composite panels, steel, wood and cork. Even with the tight timeline, research and experimentation often play a key role. The 2009 reflective, Matisse-like structure of the SAANA designed pavilion drew heavily on our experience in developing and manufacturing composite sandwich panels. The integrity of the seamless, undulating design was achieved by developing an ingenious interlocking teeth system, specially designed column head connections and by using tools more commonly associated with aerospace manufacturing, to produce invisible fixings. 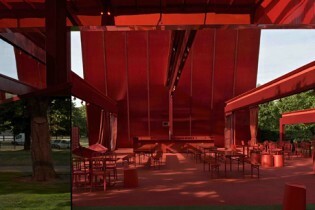 Jean Nouvell’s striking 2010 Pavilion required 45 tonnes of pillar-box red steel. 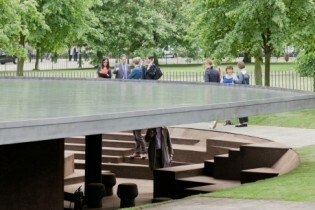 The main feature was the dramatic free-standing gravity-defying wall, which was cantilevered off a subterranean base and consisted of nine 12.5m high steel ribs, leaning at an angle of 30° and all lined up to a tolerance of just ±10mm. 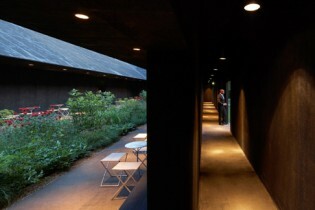 In complete contrast, the quiet, contemplative space of Peter Zumthor’s 2011 timber-built Pavilion called for more traditional carpentry and scenic skills, including our experience of subtle paint finishes. Taking the concept of a medieval ‘hortus conclusus’, Zumthor created a garden within a garden, the pavilion providing a serene backdrop detached from the noise of the city. For Herzog and de Meuron and Ai Weiwei’s subterranean design in 2012, we lined the excavated interior and thirteen supporting roof columns with cork, manufacturing the 75 tonne steel roof in sections in our workshops. The roof, which held a shallow pool, was shot blasted and given a lacquer finish on-site, adding to its reflective qualities. This year’s cloud-like pavilion by Sou Fujimoto was manufactured in just six weeks in our workshops, making use of our latest laser cutting facilities. 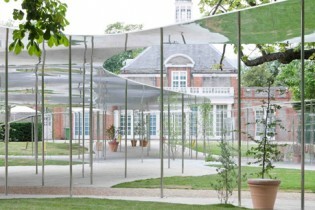 8km of steel tubing made up a series of 400mm and 800mm square frames, which in turn were welded into 55 transportable sections, the pavilion reveals different densities with some areas appearing opaque, some almost transparent. Click the links to visit the full project page, read more about each pavilion and download a PDF case study.